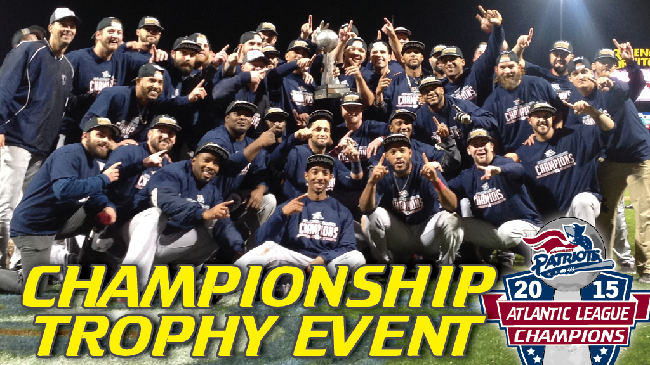 Bridgewater, NJ - The Somerset Patriots will be celebrating the 2015 Atlantic League Championship with fans at TD Bank Ballpark on Thursday, October 8th. The event will take place in the Team Store from 5:30 pm to 7:30 pm and give fans the opportunity to take pictures with the Atlantic League Championship trophy and players that are local or still in the area. Currently scheduled to appear are closer Jon Hunton and the two longest tenured Somerset Patriots, catcher Adam Donachie and outfielder Jonny Tucker. The team is trying to confirm availability of other players to join the celebration. 2015 Atlantic League Championship apparel will be available for purchase in the Team Store at the event. The Championship apparel includes the t-shirts and hats presented to the team on the field during the celebration. Other championship items will be available for purchase as well. CLICK HERE TO PURCHASE CHAMPIONSHIP APPAREL! For more information, call (908) 252-0700 or visit http://www.somersetpatriots.com.